So I'm doing my 52nd 12 of 12. Created by Chad Darnell and picked up from, what I can tell, any number of random bloggers who then link back to him and vice versa. Chad is no longer doing this, nor is successor coordinating the linking of other 12 of 12'ers anymore. Now it's just Erik, Jim and myself - that I know of. 06:20. 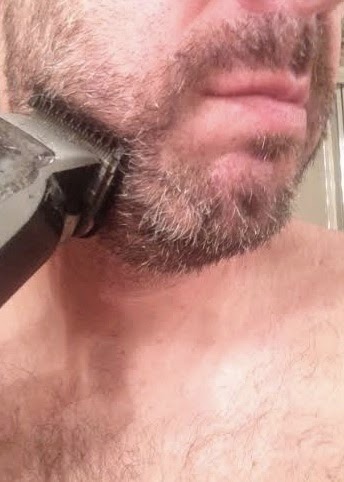 Trimming back the every increasing grey beard. Had not trimmed for at least a week. It was looking scraggly. 06:45. Warding off potential / probable Athlete's Foot. ...which I guess means that I am an athlete. 07:35. 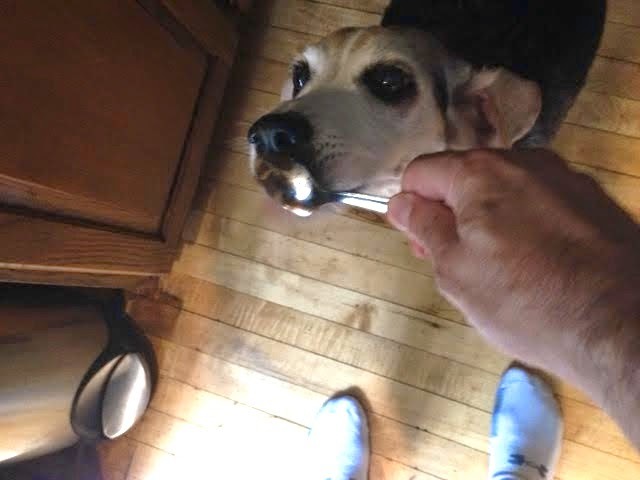 Since "someone" gets a dollop of wet food (in which I hide his pills) every morning, I "let" Petey lick the spoon to get those disgusting wet food cling-ons. Or as I call it, "pre-rinsing". Picking up the NYT for neighbor who is away. Bobbi has two of her trees covered in knit wear. I'm not sure why. 10:25. 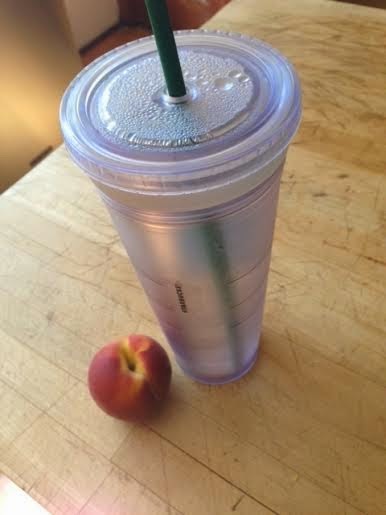 My mid-morning snack: my last nectarine and some water. 12:15. We were in need of cash. 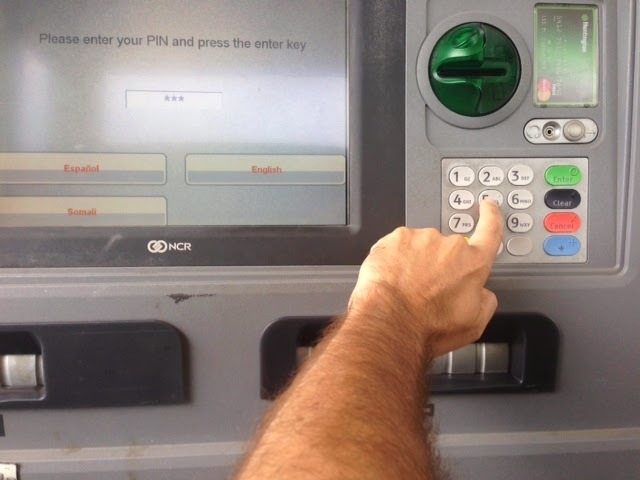 Not that this ATM helped me out. It was being rebooted. 13:00. 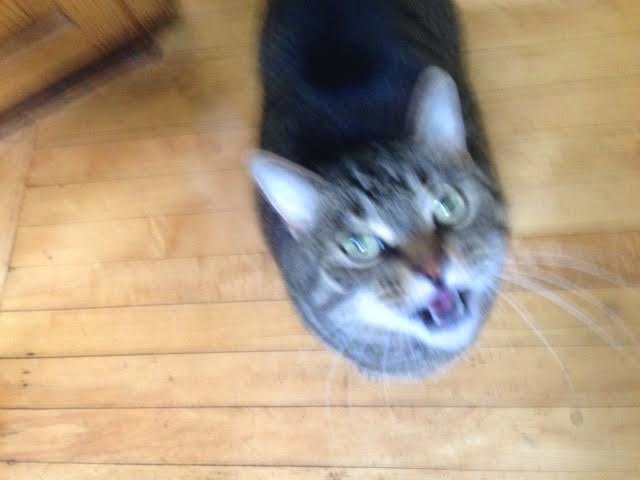 One Sophie cat yelling while I prepare lunch for me. She's starved....for attention! 14:50. 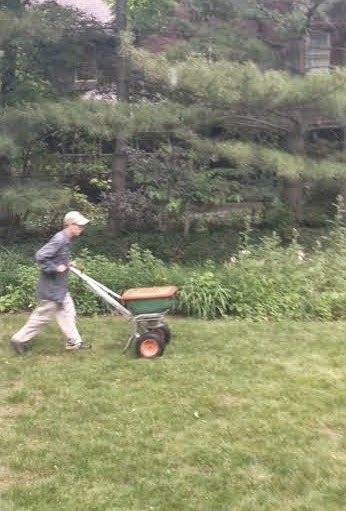 Was going to cut the lawn later, but the Scotts guy came to treat it - so I guess I'll have to wait until later today or tomorrow. Drat. 16:40. Dog Walk #2 (hehehe....#2). 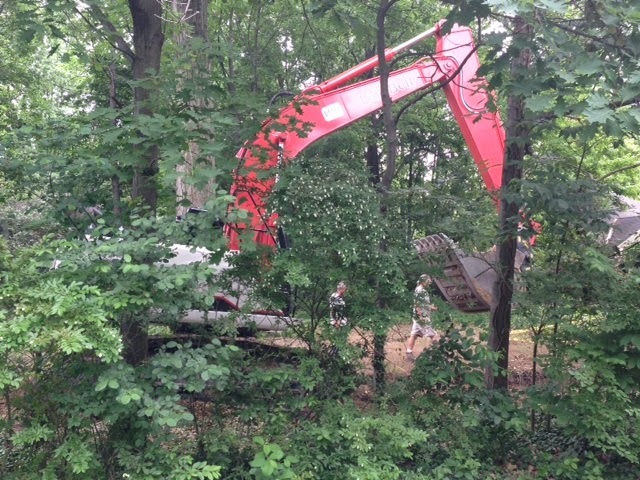 The last vacant lot in our 'hood is officially under development. Crews are there digging trenches for utilities. 18:30. 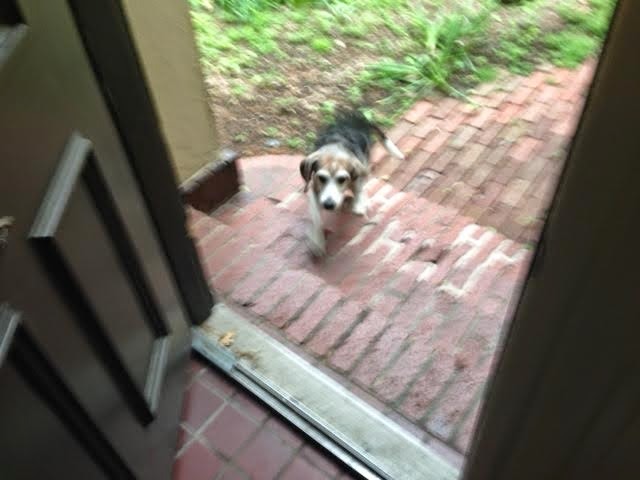 Someone is coming in from a long tinkle session. 20:00. Outside to pre-heat the grill. 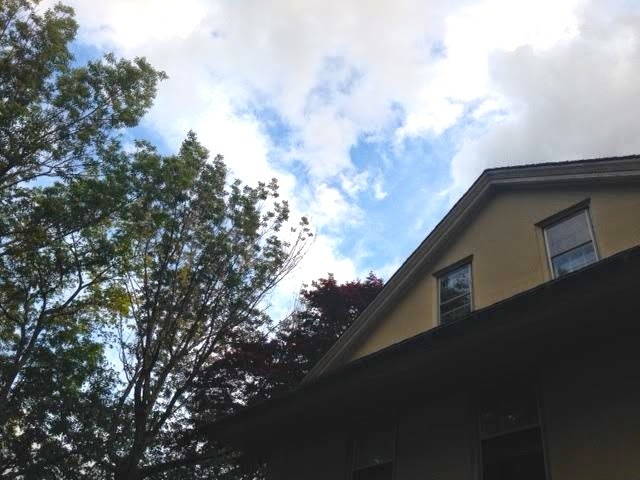 Slight blue sky, possible rain clouds. 20:20. 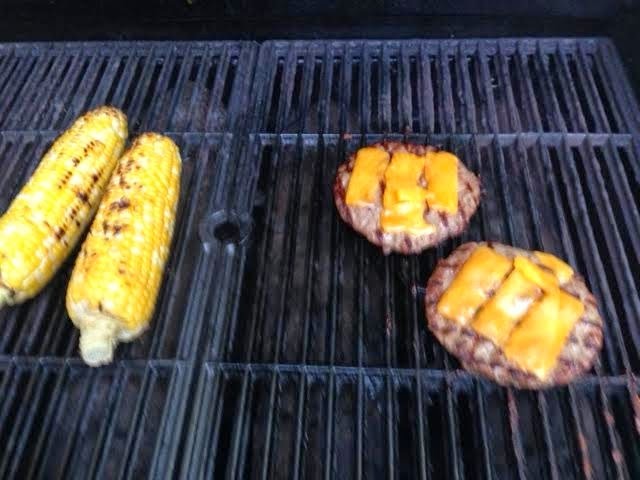 Hamburgers and corn on the grill. The corn was so sweet! While it is 12 of 12, but it is also Friday the 13th, I figured I'd go that extra step for your Baker's Dozen. I gotta dentist appointment tomorrow and this is the equivalent of cramming for the exam. "Bobbi has two of her trees covered in knit wear. I'm not sure why." - it's called "yarn bombing", just a decoration with cheap ACKrylic yarn. you see it in mainly urban areas. I'm kinda liking the Tree Knitwear! 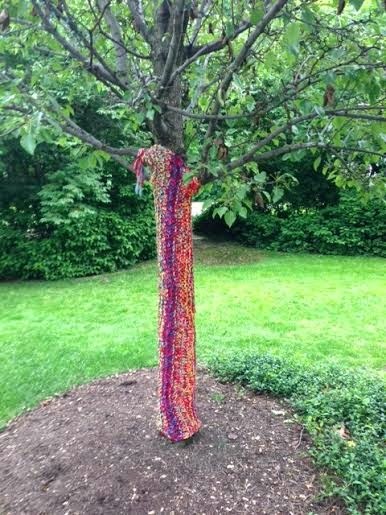 I posted something about sweaters on trees a while back and was told it is called yarn bombing. I am not sure I understand the point but it is definitely 'a thing'. There is a performing arts center in this area where they put sweaters on all the trees on the site. Not sure whether they irony of putting sweaters on trees where it is 110* F was intentional or not. 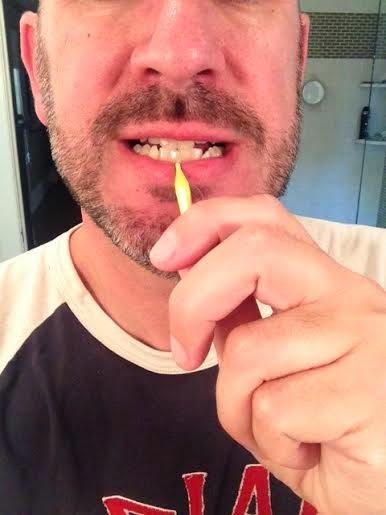 Have you ever grown out a "proper" beard? Or are you allowed to, with work? everyday when I scrape my tongue I think of you.